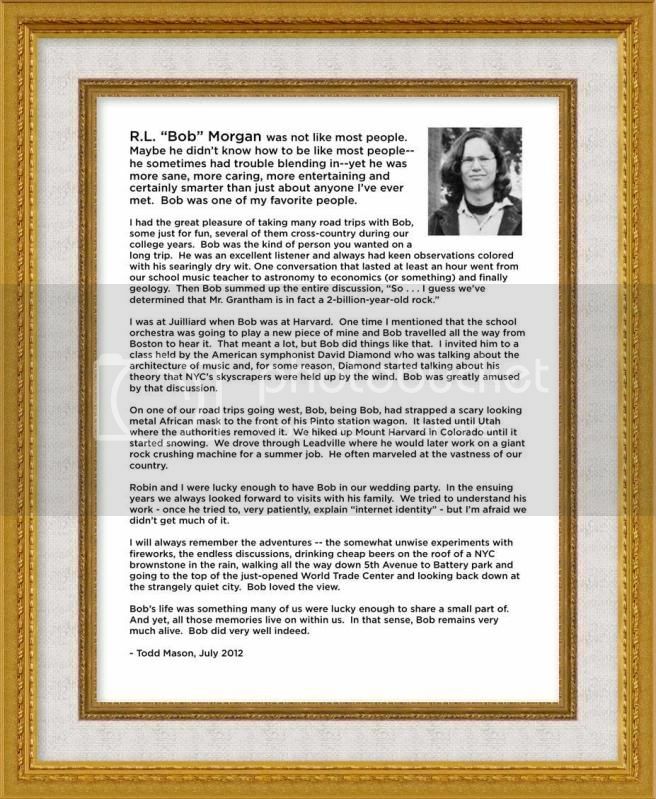 Personal and Family Life - RL "Bob" Morgan - Internet2 Wiki for your Wiki! At any given family event one of the first questions asked by my family.... Will Uncle Bob be there? Loved this guy so much. He was funny in a non assuming way, kind, and always made things more fun when he was around. I will miss him alot. Bob had such a calm manner about him and never seemed to be in a hurry. I remember when Bob and family visited Williamsburg and Busch Gardens in Virginia with us. We had such a fantastic time seeing everything and quite a whirlwind tour. I especially remember going through the aviary exhibit with birds perched on our heads and Bob snapping photos left and right; documenting the visit. Also, remember the last time I saw Bob when he got his award from I2 in Washington, DC. I appreciated so much being invited and seeing the camaraderie among Bob and his co-workers. He had so much depth. R.L. “Bob” Morgan was not like most people. Maybe he didn’t know how to be like most people, he sometimes had trouble blending in, yet he was more sane, more caring, more entertaining and certainly smarter than just about anyone I’ve ever met. Bob was one of my favorite people. I was at Juilliard when Bob was at Harvard. One time I mentioned that the school orchestra was going to play a new piece of mine and Bob travelled all the way from Boston to hear it. That meant a lot, but Bob did things like that. I invited him to a class held by the American symphonist David Diamond who was talking about the architecture of music and, for some reason, Diamond started talking about his theory that NYC’s skyscrapers were held up by the wind. Bob was greatly amused by that discussion. On one of our road trips going west, Bob, being Bob, had strapped a scary looking metal African mask to the front of his Pinto station wagon. It lasted until Utah where the authorities removed it. We hiked up Mount Harvard in Colorado until it started snowing. We drove through Leadville where he would later work on a giant rock crushing machine for a summer job. Robin and I were lucky enough to have Bob in our wedding party. In the ensuing years we always looked forward to visits with his family. We tried to understand his work - once he tried to, very patiently, explain “internet identity” - but I’m afraid we didn’t get much of it. I will always remember the adventures -- the somewhat unwise experiments with fireworks, the endless discussions, drinking cheap beers on the roof of a NYC brownstone in the rain, walking all the way down 5th Avenue to Battery park and going to the top of the just-opened World Trade Center and looking back down at the strangely quiet city. Bob loved the view. Bob’s life was something many of us were lucky enough to share a small part of. And yet, all those memories live on within us. In that sense, Bob remains very much alive. Bob did very well indeed. I have so many special memories of Bob at family gatherings - our first Christmas Eve he joined us wearing a Santa hat....I thought...."people REALLY wear those on Christmas Eve?" and Bob joined in singing Christmas Carols in his boisterous singing voice - nothing shy about that! And our Thanksgiving meals we shared together - we could always count on Bob creating many culinary delights for the annual feast that were sure to delight our taste buds. I was also priveleged to observe Bob on the sidelines during more than one of his daughter's soccer matches - there is nothing more entertaining than watching Bob with his body English and shouts of "encouragement" to the team and referees! Bob was fun and full of energy and he added much to our family experiences - one of the things I appreciate most about Bob was his smile which I will always remember as we were together with family and enjoying the companionship only shared by that special bond. I will miss Bob. Right...where to begin. I met Bob Morgan when his oldest daughter Annika joined the Lake City Ravens soccer team about five years ago. He was enthusiastic about the team and mentioned Annika's select experience and I as a Ravens coach in the Recreational division, was a bit suspicious of his parental "input." However, all concerns were quickly put to rest as Bob provided nothing but enthusiasm, a quick wit, and an undying willingness to pitch in. One memory I have stands above all. The Ravens had won the City Tournament for the last time over their arch rivals the Geckos and we had a pizza dinner to celebrate. In seasons past I had composed a poem about the Ravens efforts in that year, but always had trouble getting through it, due to my sentimental nature. So, when players and parents came to me asking about the poem I quietly demurred saying "Not this year." So, I gave a quick speech about having a great season capped by winning the City Tourney, beating the Geckos, and then sat down. Bob leaned over to me and asked if he could say something. "Please do," I said. He took out a piece of paper and laid into an Edgar Allan Poe "The Raven" poetic riff that brought the house down in its absolutle awesomeness. He managed to encapsulate the essence of sportsmanship, support for the team, and the Ravens spirit all in one fell swoop that left me grateful, proud to be part of the team...and a little bit jealous. Bob certainly contributed to the team in other ways especially on the tech side helping set up email distribution and stuff like that which was great, but that moment in December 2008 was the best. I see a lot of Bob in Annika; independent thinking, quick wittedness, and willing to put in work. I know he'd be proud of the whole family and I consider it an honor to have known him as I did. He will be missed and I'm getting sentimental just thinking about it. Oh, so many Bob's, and I loved them all! 80's Bob: Shortly after we first met, he gave me a curvy wooden stick that had been carved and painted to look like a snake. What a curious, wierd gift I thought; but as time went on I realized how much Bob loved the curious, wierd things in life. He could go on in infinite detail describing some grotesque bug he saw, and delighted in digging up an interesting book or piece of art. 80's Bob was also very outdoorsy and active. We went on several backcountry cross country ski trips together, and he was very involved with BASS. 90's Bob: It's all about the kids. I have so many memories of meeting up with Eve and Bob, all our kids in tow. He loved his girls, and we had lots of fun together at birthday parties and park outings. 00's Bob: We missed Eve and Bob so much when they moved to Seattle, but whenever possible he went out of his way to meet up with us whenever the opportunity arose. He always made me feel we were still close in distance and friendship. 10's Bob: He had the greatest concern for me when I was diagnosed with prostate cancer, even though I did not feel my disease was in the same category as his. I never heard him complain - he loved giving out the details but he never whined about it. I'll miss you Bob. Oh, and the snake? Its one of the first things I see when I wake up in the morning. A wonderful way to remember you Bob! Bob, or "Uncle Bob" as I came to know him, was a wonderful man. I remember hearing stories of Bob's rolls or Bob's bread long before I ever met him. Such a talented and insightful guy, I always appreciated time spent with Bob because it was never dull and always very thoughtful. As people have already mentioned, Bob never said something before he thought about what it was he wanted to say. Reminds me of the Ents in the Lord of the Rings, never saying something unless it is worth taking a long time to say. Unless of course the Sounders were playing, in which case Bob has plenty to say at all times. Bob, I love you and I will miss you a lot. I'm so saddened that the world will no longer have Bob in it. I have such great memories of Bob from our first BASK sea kayaking clinic together. He had a great dry sense of humor and was always a kind and gentle man. To Eve and Bob's daughters, I send my love. My deepest sympathy to Eve and the girls in the loss of your husband and dad. Eve, my deepest condolences to you and your girls. Ive known Bob since we worked together at San Francisco State University from 1980 on. What a wonderful guy was and always will be; kind, humble and always took the time to teach me new things. I was so glad he moved to Seattle after I did. Im very saddened he has left us and my sincere condolences to Eve and his daughters. I always thought Bob would be around to catch up and chat about everything under the sun. Rafting, the Tsunami Rangers, soccer, computers, family, etc. My deepest condolances to Eve and the girls. His life touched so many people and his legacy is in his girls and his work. My memories are of my first cousin Bobby as a student at Harvard. He would stay with us often and my sister and I always looked forward to his arrival. Our sympathies are with you all ax your hearts search to fill the hole left by dearest Bob, loving husband, ,father, brother uncle, cousin and friend. Bob Morgan had been part of my extended family for over 50 years through the marriage of my late wife Pattie who was his cousin. I remember baby sitting for him and his brother Michael years ago when they lived in Palos Verdes. My family was greatly honored when Bob took the time to represent the Morgan family at Pattie's memorial service 9 years ago. We send our deepest sympathy to all the family in Bob's passing and will cherish the memories that we have of him.